On Wednesday the 19th we lost a climate comrade in the the fight to protect the ancient Hambacher Forest in Germany from the ravages of fossil fueled capitalism. 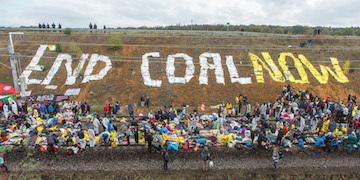 As a matter of climate justice brave protectors have been living in the Hambacher Forest for years to stop RWE energy from expanding their huge brown coal mine into the area. In recent weeks the joint forces of the police and RWE's security escalated the fight and began systematically destroying areas of ancient woodland. On Wednesday RWE were attempting to clear a treehouse village when the man went to go and help defend the village and fell 20 metres from a bridge to his death. The vast majority of whom are in the global South. Join together in sorrow and anger as we collectively channel it into a call for a world that values all life and the lives of future generations. We will stand united against the profiteering of companies scraping the bottom of the barrel of fossil fuels propelling our climate crisis. Bring candles, songs of hope, despair and joy in the face of a future we don't need to have and demand the future we deserve.